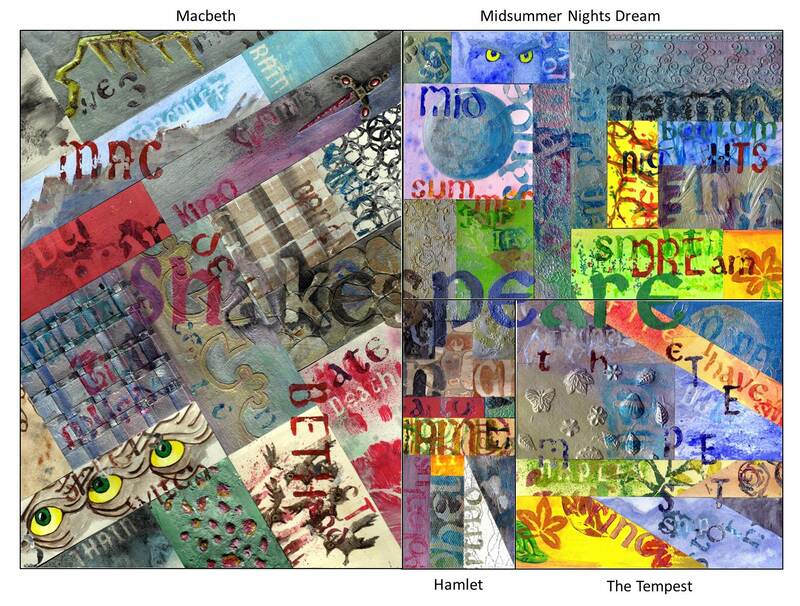 Our challenge for this assignment is to produce four, deconstructed book designs, based on a list of Shakespeare plays. 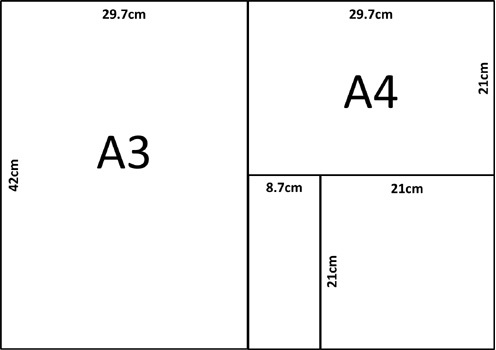 As a group, we decided how an A2 area should be split up into four book covers. The main challenge for me was I knew very little of Shakespeare and his plays. I felt somewhat daunted by the task of understanding the stories and their plots, environment setting, characters and language etc. It felt as if a study of Shakespeare was required before the task could truly be undertaken. This is a subject in its’ own right. By reading the plays’ synopses and having conversations with people who are familiar with Shakespeare, accompanied with research, I began to digest the subject. With time, I formed some understanding and I have been able to gain enough understanding of the plays to begin to explore textures. With the focus on craft techniques, textures and colours that reflect plot and setting, there is a strong element of this assignment which feels like creative art project crossing into set design (based on the environment setting). I experimented with a number of techniques and ideas starting with gluing and painting lace and feathers. I also painted through the lace, leaving some patterns and used the painted lace to imprint. I have mixed silver metallic paints with acrylics to produce opulent metallic colours. This technique is used through many of the textures, as I feel it fits well with the theme. 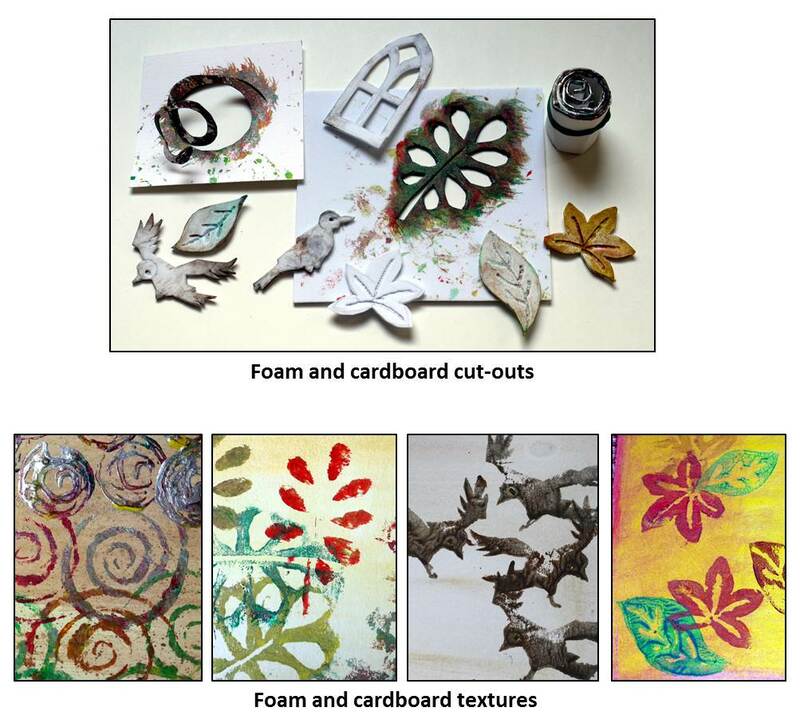 Foam and cardboard cut-outs. A soldering iron is used to carve patterns into the foam. 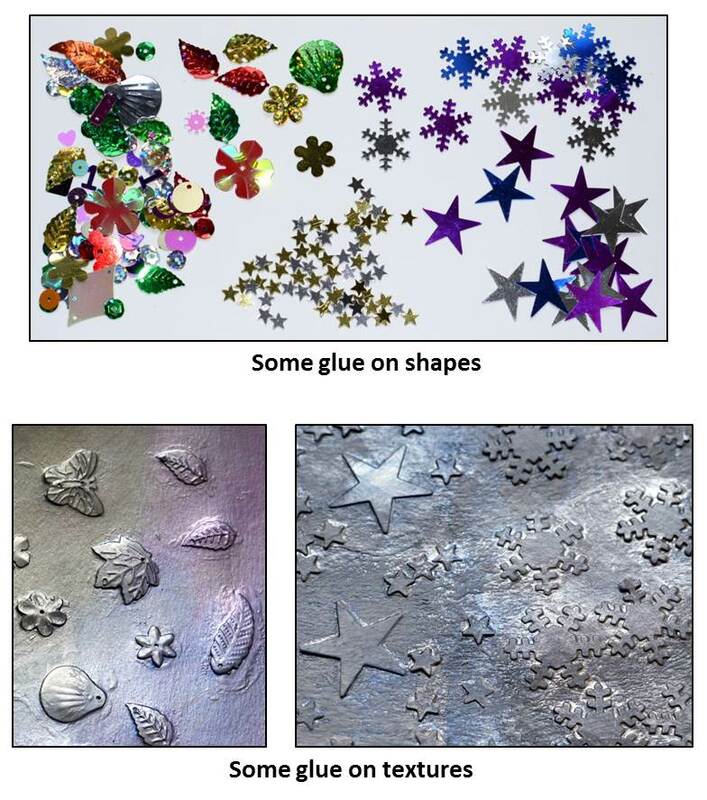 A selection of card craft and sequins glued onto the substrate and painted over. For more textures there is plenty of weaving, sponging, gluing and painting. 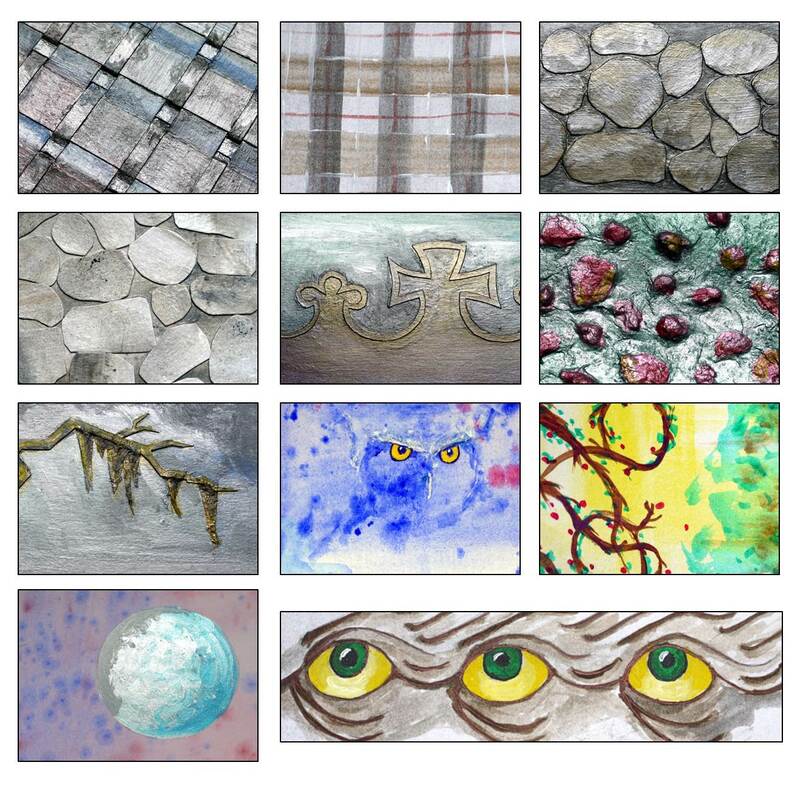 In total, I have some 25 sheets of experimental textures to use. I have scanned and photographed many of these textures so that I am able to use them digitally in the future. I have chosen not to use any digital imagery or manipulation for this exercise. I was looking for something that felt as if it belonged. 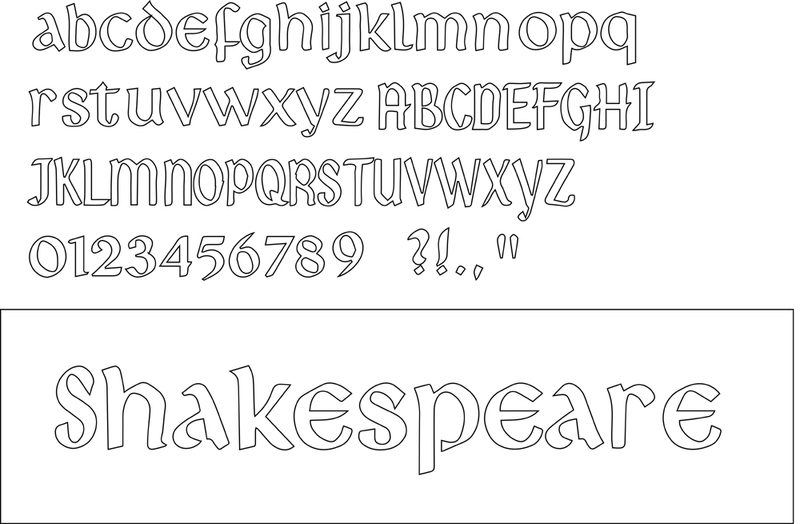 Although some of the standard fonts may have sufficed, I was looking for something that helps to express the atmosphere of the plays. 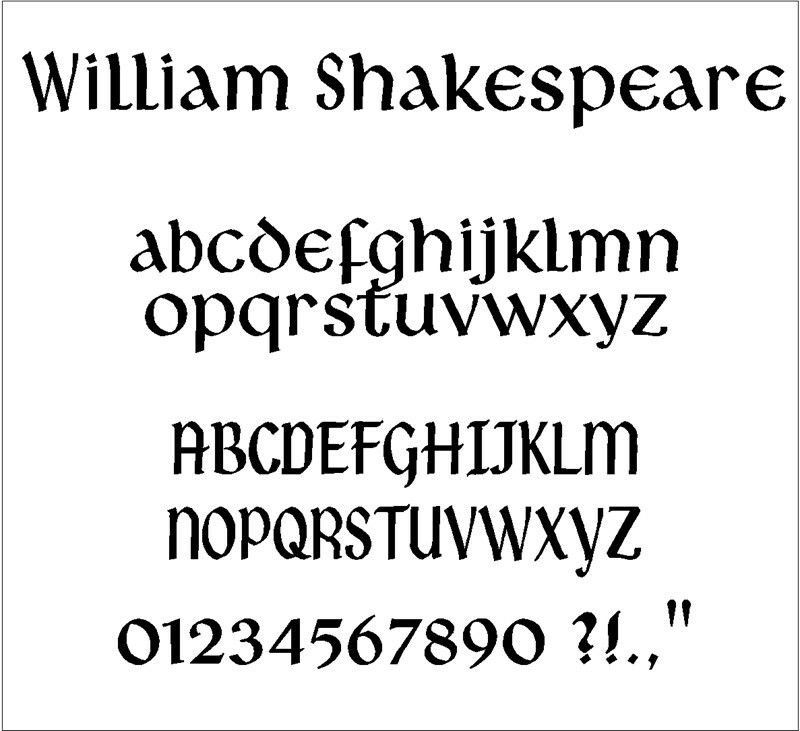 On my quest, I came across an image of a typeface that has a Celtic feel and fitted the Shakespeare brief effectively. The next step was to make the typeface usable, which meant producing block letter forms. This part involved a digital process to manufacture type blocks to use in a hand crafted manner. This image is processed and modified in Illustrator. 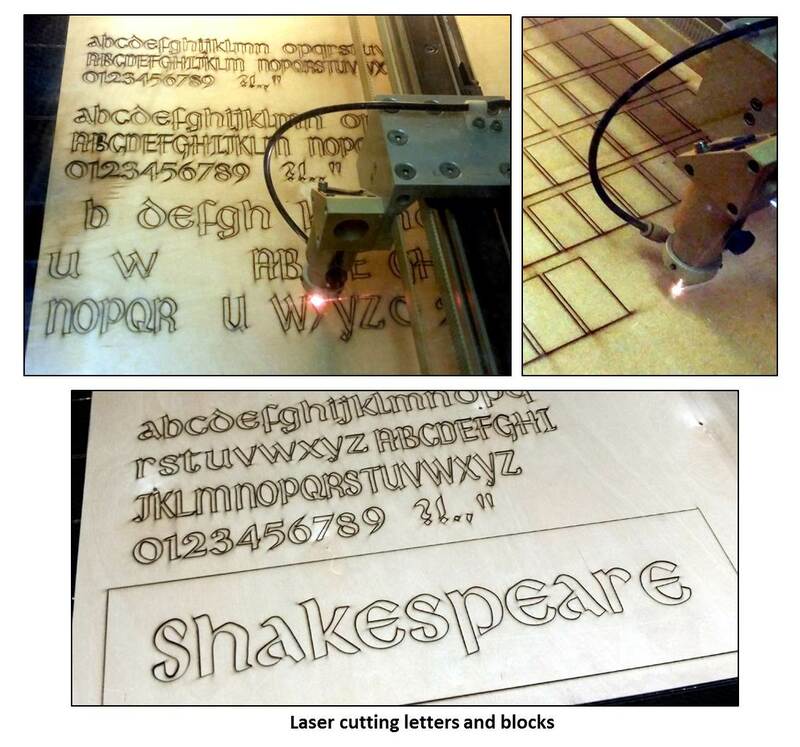 The laser cutter is used to cut out five complete alphabets of varying size. These are cut from 3mm birch ply sheets. An illustrator file is also created to make 6mm thick MDF wood blocks for these letters to be glued onto. 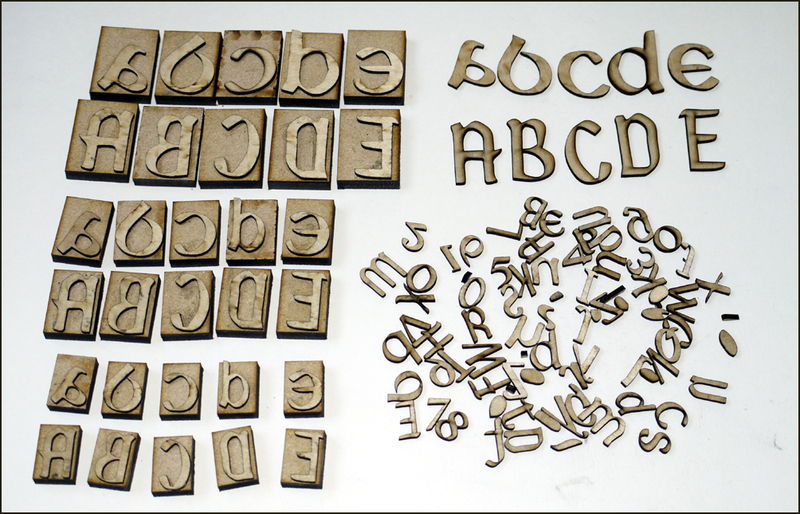 The end result is three sets of complete alphabet block letters in varying sizes. These are for block printing. Also there are three sizes of cut letters to use for negative space composition. I felt this was worth doing as an exploration exercise and these may well be useful for other projects. Having explored and played with texture, colour and text, the challenge of splicing all this up and reassembling it in a deconstructed manner feels like trying to make some designed order from mess. What seems to be clear is there is an element of randomness. The end design is through exploration and process. It is difficult to anticipate the outcome at the beginning of the project. With a selection of textures now complete, I need to decide which Shakespeare play is going to be the largest dominant design, which will be the smallest and which two are going to be mid-sized. I also need to decide what text I am using, what sized type and the deconstructed techniques of printing them. Some will be made of negative space, and some of positive space. To complete this I consider all the textures as a whole by laying them out on the floor and taking a good long look at them. This helps get an over feel of how they may fit together. Once I start to deconstruct, I cannot erase something I am not satisfied with. The difference between hand craft and digital is the willingness to commit to the next step. There is no going back. Once happy with the texture composition, I take selected textures and using various methods, I begin to place my chosen text. Once happy with the newly placed pieces, they are fixed in position. More textures and text are added that overlap the individual pieces. This adds a further layer to the overall composition. 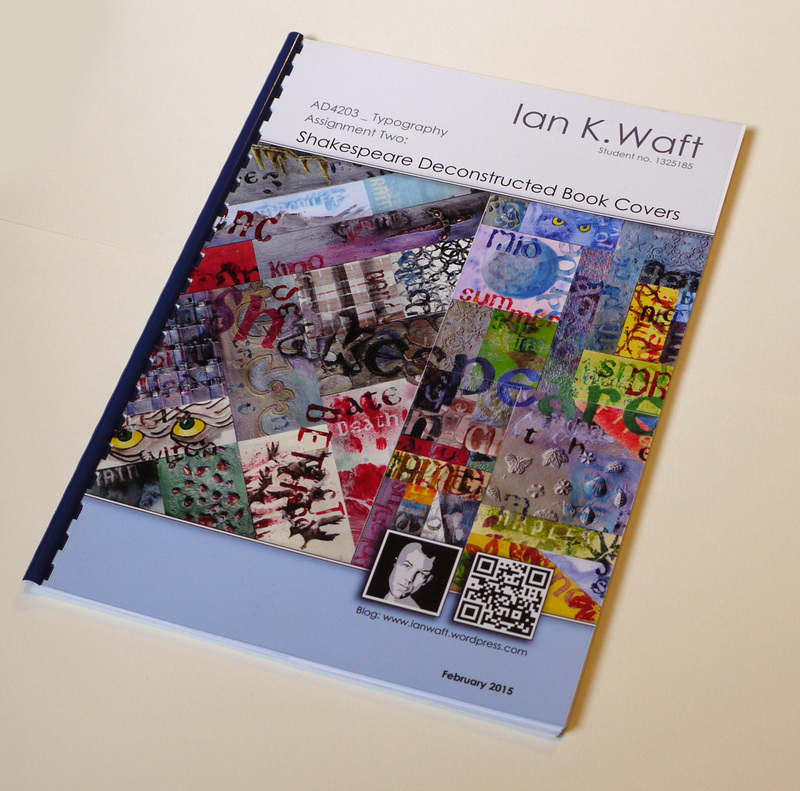 Now all the four book covers are positioned together in an A2 configuration. To complete the whole look, I use the largest laser-cut font, to etch “Shakespeare” across the all four covers. The overall effect is that when all covers are placed together, the name “Shakespeare” becomes visible whilst remaining deconstructed for each cover. Reflective diary printed and bound. This seems to have been a lengthy project, requiring much more time than formally allocated, although that may be in part due to my ambitious approach and initial concept. Block printing onto raised textures successfully has proved incredibly difficult. Stenciling using airbrushing may be a good alternative, making it possible, in addition, to achieve a ghosted, deconstructed appearance. Splicing and gluing the many elements together over a large area also proved a testing part of the process. The glue seemed reluctant to bond all the parts down and there was a lot of curling corners. It was at this stage I felt doubtful and disheartened and questioned my initial concept and approach. However, once I had left the glue to set under a weighted board, and trimmed off the excess, I could see the composition working. After applying the final layers of type, I am pleased with the end result. I have acquired an appreciation of deconstructed composition and that the end design is through exploration and process. Also I understand how we may intemperate symbols and fragments of information in order to make some overall sense and meaning of it. Similarly this has been a great exercise in expressing feelings, emotions, environments etc through texture and colour. 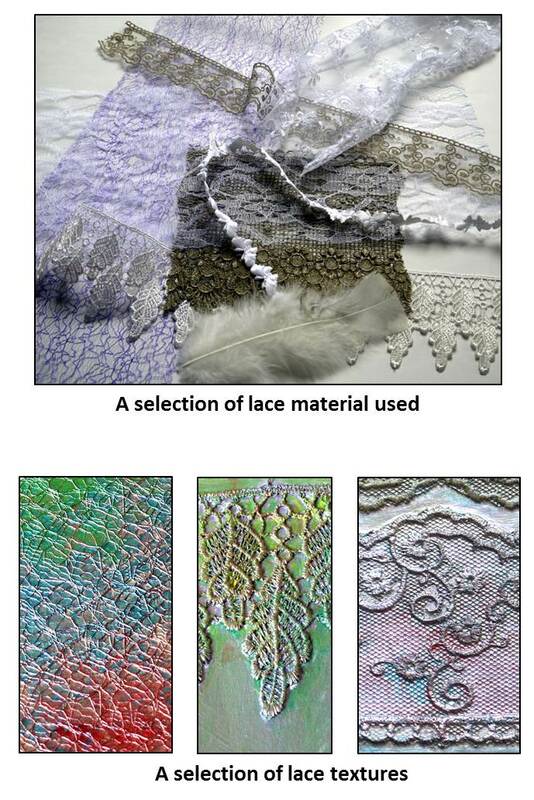 New techniques have been learned through experimenting and creating coloured textures.